This Dairy-Free Ice Cream recipe uses coconut cream. It is deliciously sweet and creamy. We made this Dairy-Free Ice Cream for a friend who is on a keto diet but also lactose intolerant. It was also another excuse for Gerri to use her favorite toy, her Ice Cream Machine. 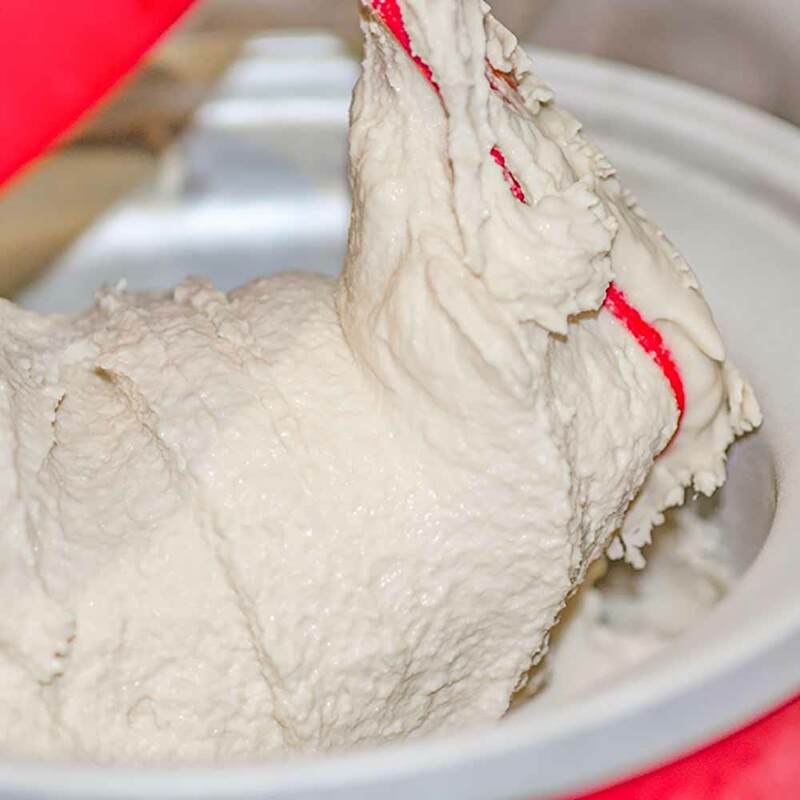 If you would like to check out another recipe we’ve made with this machine see our Keto Ice Cream Recipe Cholate Flavor. This dairy-free ice cream sets very firmly. We recommend leaving it out of the freezer for an hour before trying to scoop. 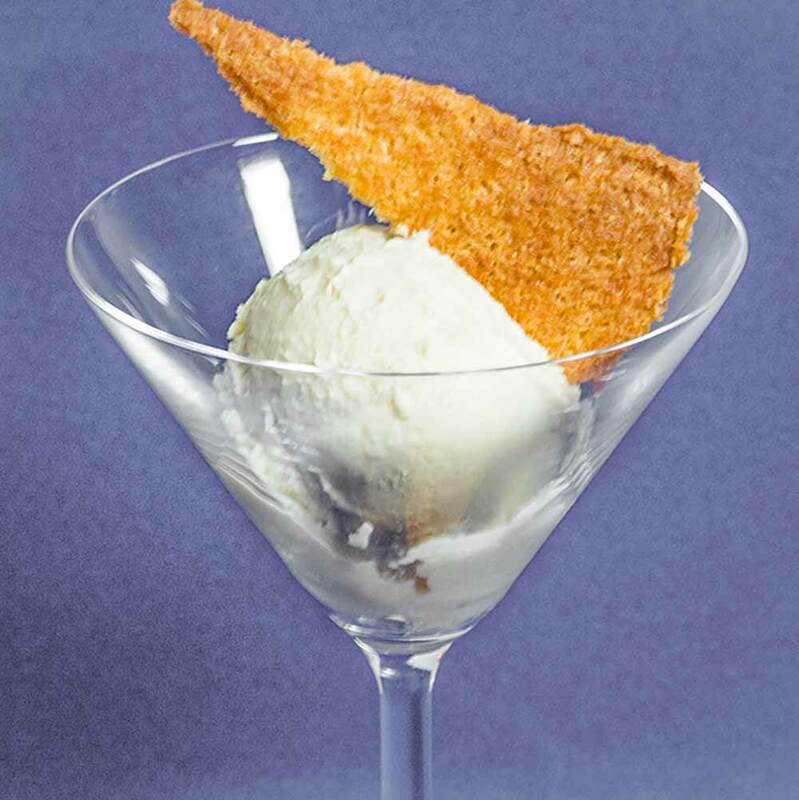 We serve our Dairy-Free Ice Cream with Low Carb Coconut Wafer Cookies, although they are not dairy free they can be easily adapted. Heat coconut cream and vanilla extract in a saucepan over low heat for 5 minutes, until it is warm. In a stand mixer, whisk together the egg yolks and Natvia until the mixture turns pale. Pour half a cup of the warm coconut cream into the eggs to bring up their temperature. Mix well. Pour the rest of the coconut cream into the egg mixture and mix well. Pour back into the saucepan. Slowly heat the mixture over low to medium heat, stirring continuously to prevent the eggs from heating too quickly. The mixture will begin to thicken and is ready when the mixture coats the outside of the spoon. It will take around 15 minutes. Pour the thickened mix into a heatproof dish and continue to stir while it cools. After 5 minutes place the dish into the fridge to cool for 40 minutes. Set up your ice cream machine and pour the cooled mixture into the bowl and churn until it resembled soft serve ice cream. We use the affordable ice cream machine above for our small test batches of ice cream. It set this batch in 25 minutes. Spoon the ice cream into a freezer safe container and store in the freezer, or straight into your mouth and enjoy. There's no need to be missing your favorite ice cream if you can't tolerate dairy. Our Dairy-Free Ice Cream uses coconut cream instead of the regular ingredients it's deliciously sweet and creamy. If you can tolerate dairy, you Must Try our other ice cream recipes. To make a larger batch of Dairy Free Ice Cream, simply adjust the serving amounts in our easy to use recipe card below. Can you make this if you don’t Havre a ice cream machine? If you don’t have an ice cream machine you can use your stand mixer or hand mixer. Once the ice cream base is cooled, put it into your stand mixer bowl or a container that is suitable for your hand mixer. Place it into the freezer. Remove the ice cream from the freezer every 40 minutes and whip for 3-5 minutes. Continue doing this until your ice cream has frozen completely – probably 4-5 times should be enough. 3 cups on the coconumt milk, or do you ,mean 3 cans?